Here is a very inspiring story how Jack Canfield, a motivational speaker, brought his book Chicken Soup for the Soul to fame. When Mark Victor Hansen and I needed a title for the book of inspirational and motivational stories that we had compiled, I decided to meditate an hour a day in search of the perfect title. My approach was simple: I asked God to give me a title – and then I sat in silence waiting for it. Nothing came to me the first two days… But on the third day, a green chalkboard suddenly emerged in my mind. I watched as a hand appeared and wrote the words, “Chicken Soup” on the board. This was in 1992, during the recession that accompanied the first Gulf War, and many people were indeed living in fear, hopelessness, and resignation. 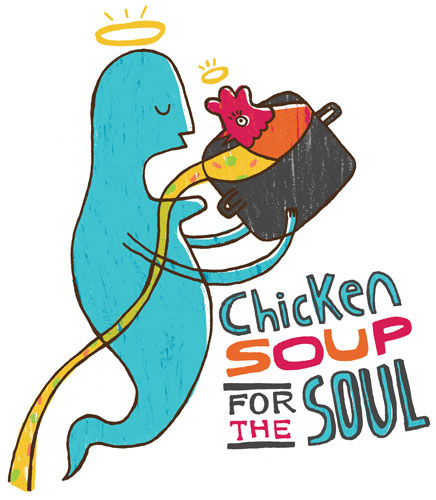 I played with the title “Chicken Soup for the Spirit,” but that didn’t sound quite right, and then it morphed into “Chicken Soup for the Soul” – and I immediately got goose bumps (what Mark likes to call “God bumps”). They almost always seem to accompany an idea that is deeply aligned with what is for my highest good. I immediately got up from meditation and told my wife, who also got goose bumps. Then I called Mark, who got goose bumps, and our agent, who got goose bumps as well. By the end of the day the full title had emerged—Chicken Soup for the Soul: 101 Stories to Open the Heart and Rekindle the Spirit. So once we had our divinely inspired title, Mark, our agent, and I headed off to New York City to sell our book. Unfortunately, during the three days, we were in New York City, no one at the fifteen publishing houses we visited was as excited about our book as we were. Everyone told us that nobody bought collections of short stories and that our title was stupid. Our agent became so discouraged that he gave us the book back and said he could not sell it. Over the next five months, we were rejected by 144 publishers. Eventually, we went to the American Booksellers Association Convention and walked the floor of the exhibit area for three days asking hundreds of publishers, “Will you publish our book?” It wasn’t until late in the third day that Health Communications, Inc., a little publisher in Deerfield Beach, Florida, decided to seriously look at our book. A month later they decided to publish it. When the book finally came out in July 1993, it was not an overnight success. It wasn’t until a year later that it hit its first bestsellers list. But it was during that year that Mark and I came up with what we dubbed the Rule of Five. We agreed to take five action steps every single day, except on holidays and vacations, to promote and sell our book. One day, we called five radio stations and asked them to interview us about the book. On another, we sent out five free review copies to book reviewers and influential people. One of those people was the producer of the hit television show Touched by an Angel. She was so taken by the book that she required all of her writers, directors, cameramen, and other crew members to read the book. She said that the feelings generated and evoked by our stories were the same ones she wanted to create in their TV episodes. That story made it into Variety and later onto the Associated Press wire and generated thousands of book sales. We also bought the book 1001 Ways to Market Your Book, by John Kremer, and wrote each way on a Post-it note and stuck them all on a long wall in our office. We did five of those suggestions every day. Eventually, Chicken Soup for the Soul reached number one on the New York Times list and stayed there for almost three years, selling ten million copies along the way. Most of us aspire to write a book and ofcourse make it successful. While writing a book is tedious but easier than making it successful. Hindustan Times has compiled eight points that Indian authors recommend for making a book successful. Although Preeti Vyas is not an author herself, her husband Amish Tripathi credits her for being the driving force behind the marketing of the books. Let us know what is your experience?